Trim any excess fat from the shanks. In a Dutch oven, add olive oil and warm over high heat until it starts to shimmer. Season the shanks with some of the salt and pepper and sear for about 2-3 minutes per side. Don’t overcrowd the pan. You may need to do this in batches. Remove the shanks and place them in a bowl, then pour off any remaining fat in the bottom of the pan. Keeping the Dutch oven off the heat, add the garlic, onions, carrots, celery, and herbs. Now add the lamb shanks along with any liquid that has drained from them while resting. Pour in wine, water, chicken stock, and add the rest of the salt, & pepper. Cover and cook for 4 1/2 hours, uncovering for the last hour. Meanwhile, make a gremolata by combining the lemon, chopped parsley, and minced garlic in a small bowl. Refrigerate until ready to serve. Remove the shanks from the dutch oven and set aside. Strain the liquid, skim off any fat, then pour into a large saucepan. Bring the liquid to a boil and turn down to a simmer. Add the sugar and allow it to reduce down for about 20 minutes… the longer you reduce the thicker it will get. Taste to see if it needs more seasoning. While the sauce is reducing, make your Parmesan polenta (recipe here). 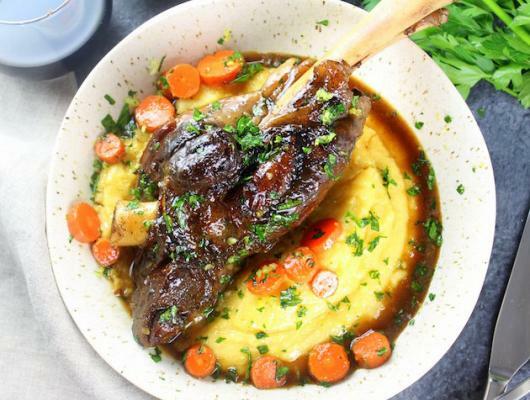 Serve lamb shanks over Parmesan polenta, drizzle some of the reduction on each shank, then top with the gremolata. 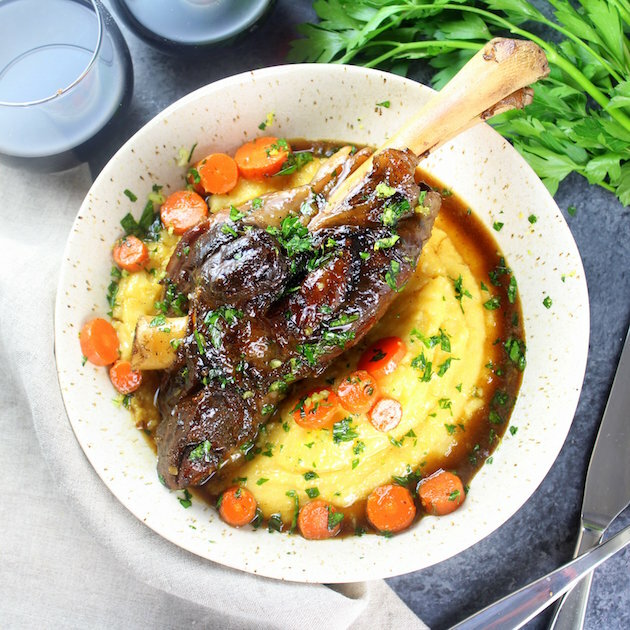 Slow Cooked Lamb Shanks - full of rich hearty flavor! They’re braised low and slow for hours in white wine, herbs, and veggies.